Don’t cut down your ash trees! 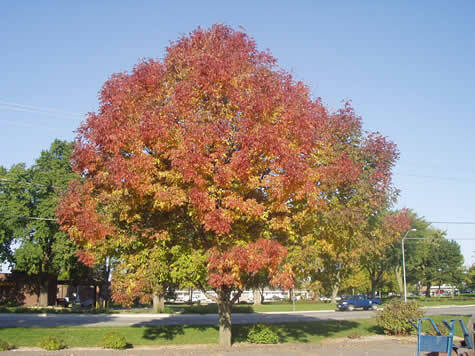 The Autumn Purple Ash is one of the most common trees in the midwest. The publicity surrounding the steady progression of the Emerald Ash Borer has raised the anxieties of many homeowners. Some have even started to preemptively cut down their ash trees. If you planted a named variety of ash tree (e.g. Autumn Purple or Marshall’s Seedless), it’s probably safe to remove it preemptively if you’re so inclined. However, for the love of ash trees everywhere, please do not remove mature or native ash trees! It’s quite possible that your tree is resistant to the insect! Were that the case, cutting it down preemptively would unnecessarily rob you of its beauty. Even more sobering, preemptively cutting down a resistant tree would rob plant breeders of valuable genes that may exist nowhere else. Some people believe that the effects of dutch elm disease and the chestnut blight could have been lessened if people hadn’t panicked and removed resistant (or tolerant) trees unnecessarily.